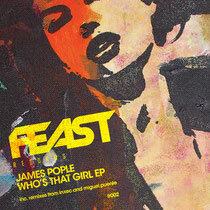 Feast Records release ‘Who’s That Girl’ EP by James Pople this August, backed with remixes from Inxec and Miguel Puente. Feast Records was born out of the Infamous London based ‘Feast’ events and launched back in April with Sean Roman’s ‘The Moan’ EP, with remixes from MANIK and Waifs & Strays. British producer James Pople now joins the roster, following releases on rising imprint Lower East and Love Not Money alongside the likes of Lee Foss, Bubba and Nico Purman. ‘Who’s That Girl’ bursts into action with a punchy 909 kick-drum, an iridescent swirl of soulful vocals and deep atmospherics. Pople displays his adaptable approach to production, employing a range of modern and classic influences, with strains of house evoked through a bright piano lead that flows alongside resonant synth bursts. ‘Say I Move You’ follows, again blending multi-flavoured themes. A playful bouncy bass hook runs alongside syncopated beats. Filter sweeps and off kilter stabs creates surreal imagery while subtle variations in the groove capture an alluring vehemence. Culprit recording artist ‘Inxec’ steps in to rework ‘Who’s That Girl’, applying his infectious driving feel to the original number, the British producer adds a fervent shuffle to the drum programming and works in a vacillating vocal chop to motivate its undulating nature. The groove is carried for over five minutes before being stripped back to a ethereal melody that tails out the rest of the track. Closing the release, hotly tipped Mexican producer Miguel Puente of No.19 Music and Hot Waves fame puts his twist on ‘Who’s That Girl’, dropping the tempo slightly and capturing the vibe of his previous works with a grandiose bassline as the driving force. This is cleverly altered throughout to create an evolving dynamic while the sensual vocals are meticulously delayed and reverberated. It’s out 13th August.